The Vision Gran Turismo sheds light on the design language Bugatti has developed for the next chapter in its story, following on from the successful end of the Veyron era. March will see the next key event in the company's calendar: the world premiere of the Bugatti Chiron1 at the Geneva Motor Show. The Chiron will embody the latest interpretation of Bugatti's design DNA and will further secure the brand's cutting-edge profile on the market. With the Chiron, Bugatti retains its position as the manufacturer of the fastest, most powerful, most exclusive and most luxurious supercar series in the world. 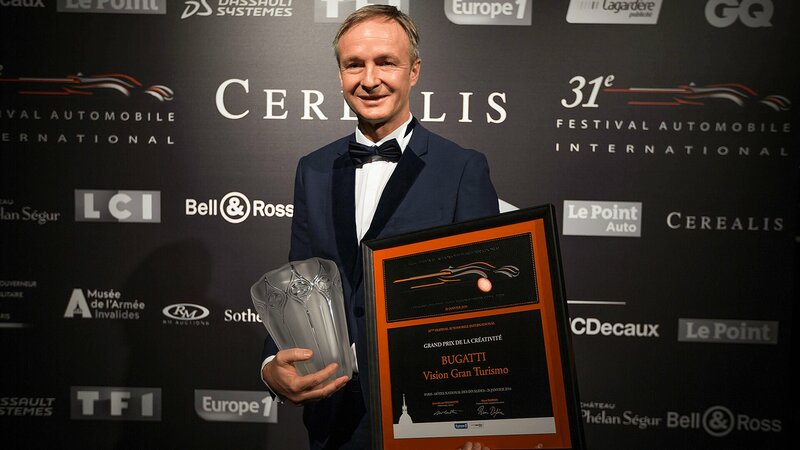 In Paris, Achim Anscheidt, Bugatti Design Director, accepts the „Grand Prix de la Créativité“ for the Vision Gran Turismo.